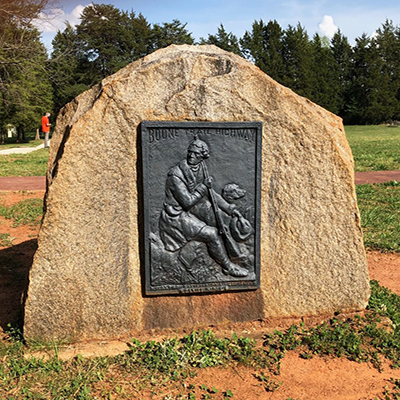 This Boone Highway marker is a Style-3 tablet placed in 1928 on the north face of the Fort Dobbs marker dedicated in 1910 by the Daughters of the American Revolution. The steel Style-3 tablet was primarily used between 1927 and 1938 and is distinguished by the BOONE TRAIL HIGHWAY caption being slightly curved. It holds an image in relief taken from Alonzo Chapel’s 1861 illustration of Daniel Boone and his hunting dog. The Ft. Dobbs marker is a large oval shaped granite boulder standing about three feet high. This Boone Highway marker was numbered 29A by Everett G. Marshall. His interest and research of the markers led to the book, Rich Man: Daniel Boone. The numbering system was simply the order in which he found or became aware of a marker. The ceremony opened with the American creed and flag salute by members of the Fort Dobbs Chapter Daughters of the American Revolution and guests. J. Hampton Rich gave a short talk on Fort Dobbs and Daniel Boone prior to the unveiling. 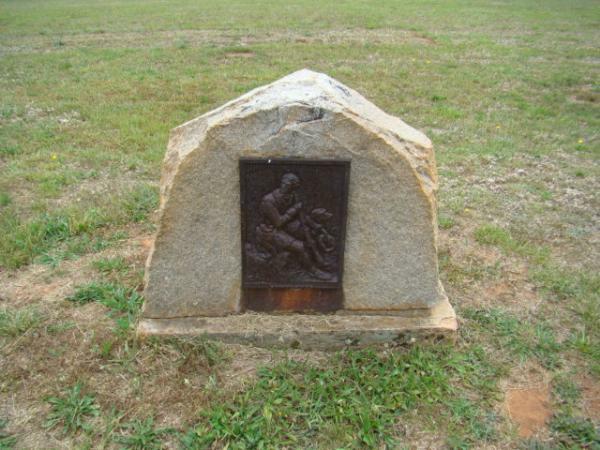 The memorial marker is located at 438 Fort Dobbs Rd, Statesville, NC. This Boone Highway tablet was placed in 1928 on the north face of the Fort Dobbs memorial dedicated in 1910 by the Daughters of the American Revolution. The 32-acre site is mostly an open field. A small wooden building which was originally the local Daughters of the American Revolution chapter house serves as a visitor center. As of 2016 plans were underway for a full-scale replica of the fort to be built on the site.